I am often asked, "How do I choose a good guitar for my daughter/son/grandson/granddaughter when I know nothing about guitars?" While trying to answer the question, I invariably go through a list of things that are important, followed by less-than-satisfactory details that most guitarists would understand, but most lay people - who may not have even touched a guitar - would grasp only incompletely. I danced this typical and inadequate question-and-answer pas de deux for many years until I finally said to the grandmother of one of my students, "I will write an article that will hopefully help you make an informed decision when buying a guitar." This is my attempt at explaining this complex process so that anyone might be able to understand. It is not an exhaustive or extremely detailed description, so by all means search the internet for more information. You will find many articles on the web with a lot of great advice on what to look for when buying a guitar. In particular, some websites have some really good information about various kinds of guitars, such as steel string acoustic, electric, acoustic/electric, nylon string, etc, and which type might be best for a particular person's needs. 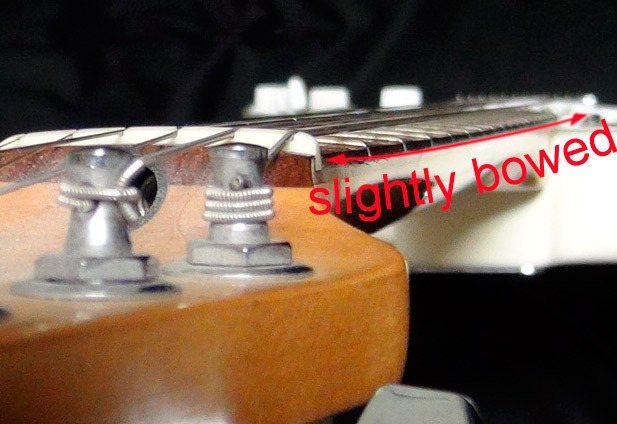 Rather than go into a rather lengthy discussion that is all-inclusive, I will address some of the more technical aspects of inspecting a guitar. Before you read the more detailed information found below, here are three links that I hope you'll find particularly useful. Please note that I have no relationship with the website that these links refer to. I'm not giving an opinion about their products, only that I mostly agree with their advice on buying a guitar. Look for obvious flaws such as cracks in the wood, peeling paint, dents, scratches, and other cosmetic problems. The neck should be nearly straight as you look directly at it from the end, either from the tuning peg side or the opposite end. Nylon string guitar necks should be straight (not bowed) from end to end, while steel string guitars should have a very slight bow. Larger bows are not good unless you intend to shoot arrows. ;-) The neck should also not be twisted. Twisted necks and excessive bowing often cannot be easily fixed. 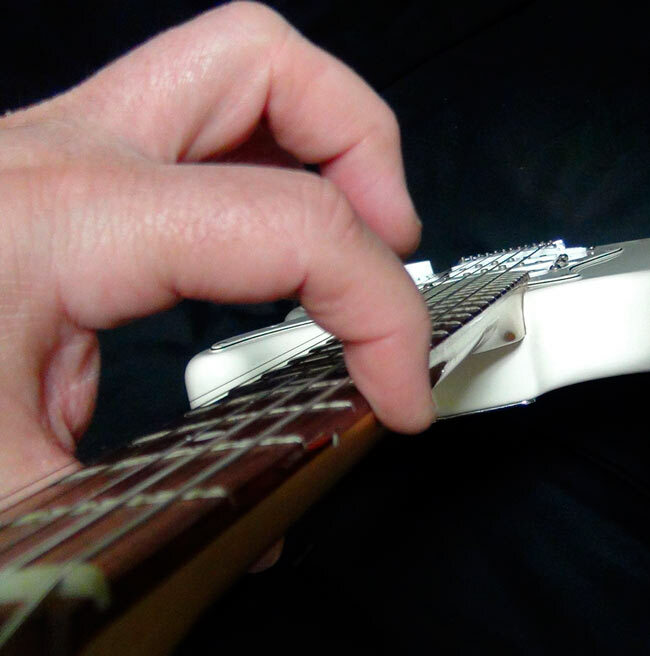 The frets (more correctly, "fret wires") should look like they are exactly the same height while looking at the fretboard from the extreme end, either from the tuning peg side or the other end of the guitar. Any fret wire that sticks up even slightly higher is a problem that may require repair. 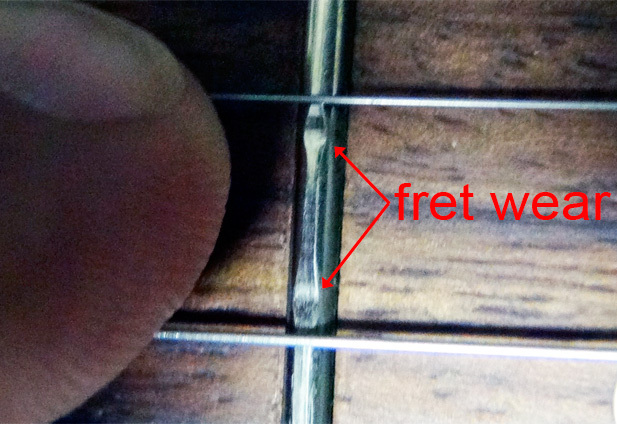 If several fret wires are higher, it is a sign of poor workmanship that is not easily repaired. The fret wires should be smooth, not sharp, when running a finger down the ends of them on each side of the fingerboard. Sharp edges are a sign of poor workmanship or wood shrinkage caused by lack of humidity. The former requires repair by an expert while the latter can be solved simply by keeping the guitar in a room with 40-50 percent humidity. Turn each tuning peg no more than an eighth of a turn one way, then the other (turning too much can break a string). Each peg should turn smoothly and offer only a little bit of resistance. Look carefully where the strings cross over the fret wires to see if the fret wires are worn. If they are worn you will see little dips where the strings have worn away the metal. New guitars should have no fret wear. 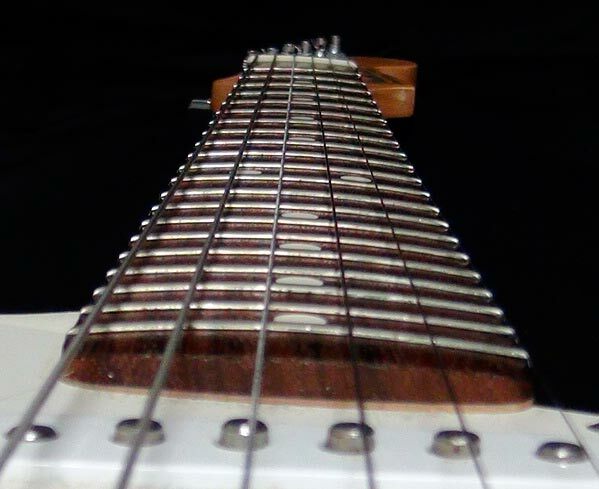 It is normal for fret wires to wear over time, but if the wear is excessive the strings will buzz when played. Excessive fret wear may require fairly extensive repair work. Inspect how the strings are spaced as they pass through the grooves at the nut. They should be spaced evenly. The outer two strings should be the same distance from the ends of the nut but not too close to the ends. Uneven spacing is a sign of poor workmanship. Check for loose or missing parts and screws such as loose strap buttons (where the strap is attached), knobs, switches, and other items. 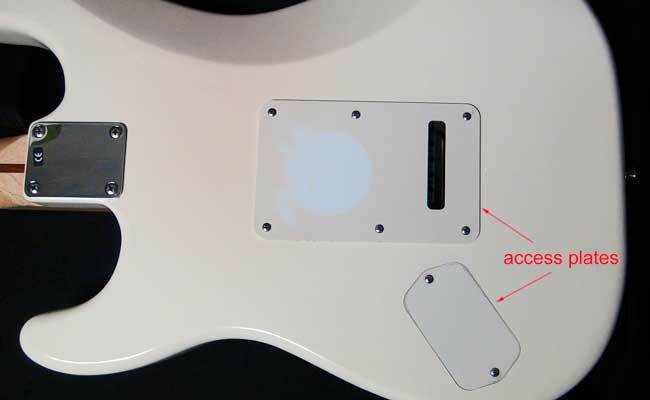 With electric guitars that have access plates on the back, check to see if the screws are loose, missing, or not flush. If it's an acoustic guitar, see if the top is solid or laminated. 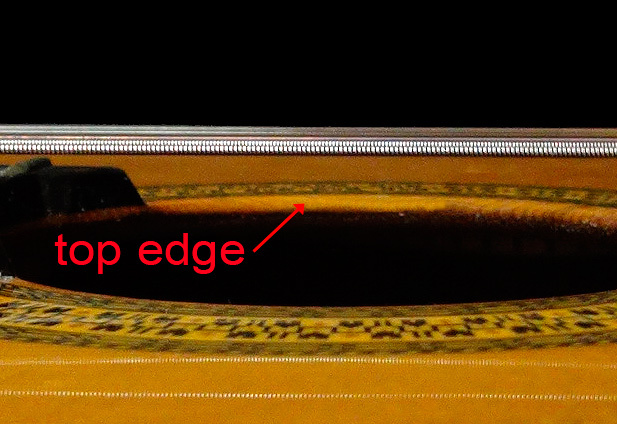 The top is the wood sheet that the bridge is connected to and where the soundhole is found. Look at the edge of the wood encircling the soundhole. If it looks layered like plywood it is laminated. Solid tops are more expensive but generally have better tone. Check the condition of the strings to see how dirty or worn they look. Strings are easily replaced at low-cost. 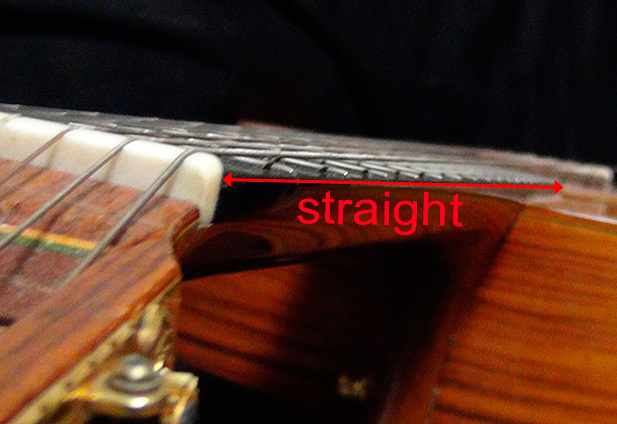 On acoustic guitars, carefully inspect where the bridge is attached to the body and look for gaps - signs that the bridge may be coming loose or was not attached properly. If allowed to get worse, it's possible that the bridge may eventually come loose. Immediately find a good luthier (guitar builder/repairer) to fix this problem. You need to be able to play the guitar to do the following items. If you don't know how to play, find someone who can play the guitar for you because these are important steps in evaluating a guitar. Play every single note (up to 144 of them on 24-fret guitars!) at a relatively loud volume and note any buzzing sounds or wrong pitches. Compare the fretted octave (twelfth fret) with the one-octave natural harmonic on every string. The pitches should match exactly. 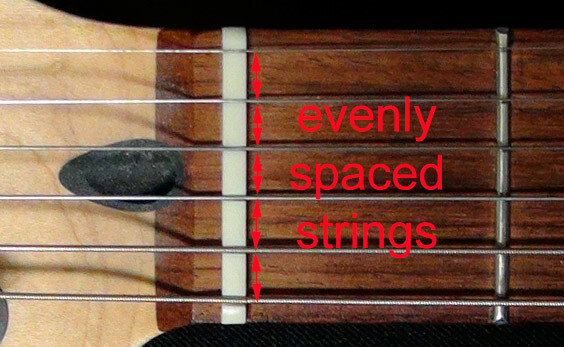 If all of the strings do not match it is probably a sign that the neck and/or bridge need to be adjusted. If only one or two strings do not match, it might simply need a new set of strings or a simpler adjustment of the bridge. Play notes and chords in various registers at various volumes and listen to how the guitar sounds. If it is an electric guitar, pluck it loudly and adjust each electronic control through its full range while plugged into an amplifier to make sure everything works properly. With electric guitars, and acoustic guitars with built-in pickups, unplug the cable, then plug it back in and play the guitar. Jiggle the plug a little bit while strumming the strings. Assuming you have a good cable, there should be no loss of connection or unusual sound. Play various notes on all the strings and note how hard you have to squeeze with your fretting hand to get a good tone. Strings that are too far away from the fret wires (this is called "high action") will make the guitar difficult to play. The ideal distance between strings and fret wires is subjective, but in general it can be adjusted fairly simply with a good "set-up". 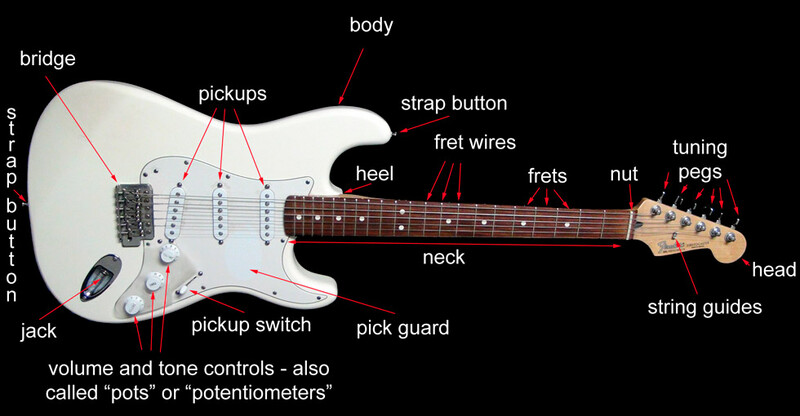 A set-up is done by adjusting various parts of a guitar to get the best intonation (correct pitch) and playability (the amount of action that is preferred). Guitars that are difficult to play can sometimes be improved by simply installing strings that are thinner (smaller gauge) or made of a more flexible material. I hope you have found this information helpful and understandable. There is much more I could write about buying the right guitar (especially for children and people with smaller-than-average hands), but it will have to wait for another time. In the meantime, do as everyone does these days and search the internet. I'm sure you will find plenty of additional information.